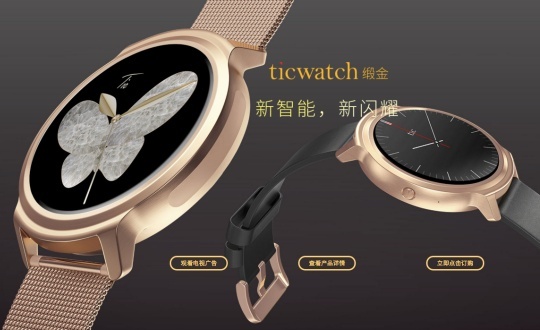 This golden smartwatch runs Mobvoi's own operating system, Ticwear, and could reach other markets in the no-so-distant future. Mobvoi is a Chinese company that was founded back in 2012 and developed Chumen Wenwen, a voice recognition and search service very popular in China. Thanks to its accurate algorithms that deal with multiple dialects and have the socio-cultural context of the users built-in, this service handles Chinese language speech recognition much better than Google's similar solutions. Now, Mobvoi's Ticwatch smartwatch runs the company's own operating system, dubbed Ticwear. Although both have been designed for the Chinese market, there is a good chance to see them hitting the global market quite soon. This smart wearable has a 1.5-inch touchscreen with 320X320 pixels and Corning Gorilla Glass 3, a 1.2 GHz ARM Cortex-A7 processor, 512 MB RAM and 4 GB internal storage. It features both WiFi and Bluetooth LE connectivity, a heart rate monitor, 300 mAh battery and wireless charging. The Mobvoi Ticwatch is IP67-certified for protection from the elements and has a simple, yet attractive design. While Mobvoi Product Manager Yili Lin "hinted that an international version could be released in the future" during a talk he had with TechCrunch, he did not mention any specific information on pricing or availability, so we can only wait for more news on this. We will keep you posted as usual.